« DarkMan » is a game released on 1991 and was about the movie of the same name (Sam Raimi). The game was quite good (fighting and platforming). I met one new programmer Fabrice « Mister M »/ »Man Hunter » who was living in the same town, and neighour of one of my past good school friend. Fabrice was from apple2 computer and started coding on Amiga. We decided to create one trainer for the « Darkman » game. I can not remember why 🙂 We coded one nice intro (I guess too nice for « just » one trainer). The nice arts have been done by Kreator. 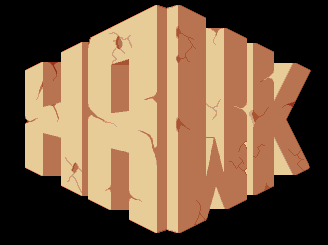 The big HAWK logo is really wonderful. In fact it have been done for our next mega demo, but we also used it in that trainer. The group « T.S.F » (see previous part) have changed to new group called « Concept ». Tebirod is now active member. He nicely composed one music for us. ; TRAINER TOO BY MISTER M’ THERE CAN BE ONLY ONE HUNTER.